We’re fairly openminded diners, the three of us, but each of us has a small list of foods we’re not overjoyed to eat. I’m not a big fan of ground beef or sweet-and-sour anything; Luke avoids onions, mayonnaise, and all seafood except for calamari; Tom has an aversion to mushrooms and olives. When one of us is gone, the others use that opportunity to eat the foods the absent family member dislikes. So, with Tom spending the evening in Madison, Luke and I went for pizza with olives and spinach. 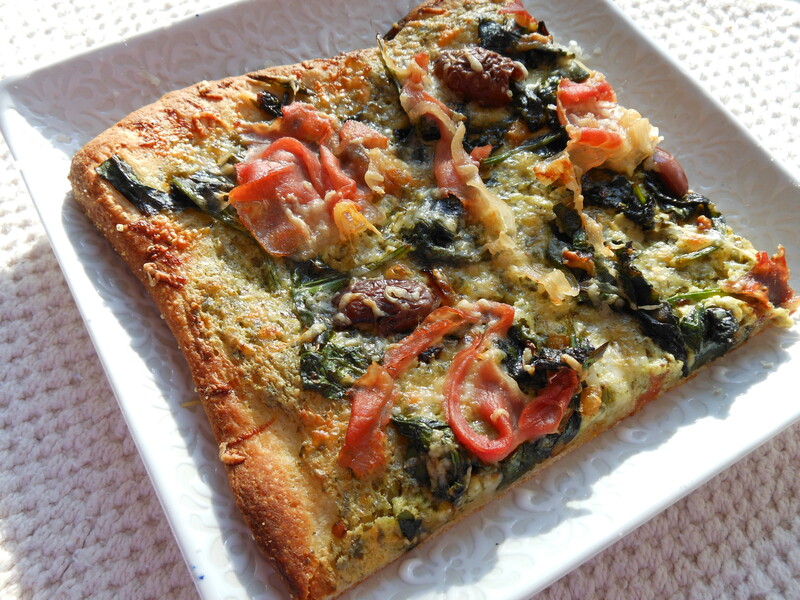 Tom loves both pizza and spinach — but separately. Confession time: I used pizza dough from a can. My right hand’s still out of commission, so kneading is out of the question for several more weeks. It turns out I tore the ligaments that attach the thumb to the base of the hand, so we’re looking at six to eight weeks of recovery. I am keenly aware of the lack of a stand mixer. Ricotta swirled with pesto (I used chive-pistachio) is a creamy, herbalicious stand-in for tomato sauce. Calamata olives bring briny saltiness; spinach, a mellow earthiness and a boatload of nutrition. The strips of prosciutto on the top layer crisp up in the hot oven, and crackle when you take a bite. The whole thing goes together quickly. You can certainly use frozen spinach in place of the fresh; thaw it and squeeze it dry. No prosciutto on-hand? Use a good-quality salty ham instead. The cornmeal serves two purposes: it keeps the dough from sticking to the pan (or the parchment), and it makes the crust extra-crunchy. It’s not necessary, but do give it a try. Heat the oven to 475 degrees F. Line a cookie sheet with parchment and sprinkle with cornmeal. Spread the pizza dough on the pan. Sauté the shallot, garlic, and aleppo pepper in olive oil until the shallot is tender and lightly browned. Rinse the spinach and add to the pan with the water still clinging to the leaves. Sauté for a few minutes, just until the spinach is wilted and any liquid has evaporated. Set aside to cool. Mix the ricotta and pesto in a small bowl. Spread the ricotta mixture evenly over the dough. Distribute the spinach over the ricotta, then top with the olives. Sprinkle with parmesan. Pull the prosciutto into shreds and drape on the top. Bake for about 15 minutes, until the edges of the crust are golden and the prosciutto is crisp. This entry was posted in baked goods, main courses and tagged ham, pesto, pizza, prosciutto, quick dinner, ricotta, spinach. Bookmark the permalink. But I am happy to be back here and I love your pizza. There is nothing much better than pizza made at home with good ingredients. I don’t do it much, but maybe tonight is the night. Thanks for the recipe. We tried your molasses cookies this weekend. We were out of ground ginger and used allspice instead. They were very good. Peg, I love that you made the cookies anyway, without the ginger, and I certainly am pleased that they were tasty. As to pizza dough, I often use the easy, cheesy no-knead bread–without the cheese filling http://bit.ly/IQBZDY. Don’t use your bread flour, just use the self raising flour. It just has salt and baknig powder in it. It wont be as chewy, but it will raise. If it is too old it will not. The sodium bicarbonate in the baknig powder is what makes it raise. The bicarb has a shelf life. If that self raising flour that you have is like 2 years old, throw it out and use bread flour. It won’t taste right or have the right texture, but it will still be eatable and chewy. One last thing Bakers have been putting ascorbic acid in ARTISAN type loaves for many years now to make holes inside the crumb. If you have vitamin c tablets, you have ascorbic acid. Just crush up about 1/2 tsp for a 1 lb loaf recipe and sift it into your bread flour.Good luck! You need some sort of leavening. Baking powedr can be substituted with other pantry ingredients. Keeping in mind that a chemical rise dough is a biscuit dough (like UNO thick crust). You can make a biscuit dough with baking soda and cream of tartar or baking soda and buttermilk.If you have none of these, then all you can make is a unleavened bread and it is not the best base for a pizza but it can be done. Here’s what to do if you do not have the aboveMake the dough as you would for pizza but with twice the oil.Roll out unleavened dough very thin, (1/8 ) to make a cracker type crust, no larger than a dinner plate, for strength, since they’re thin.. Prick the crust all over with a fork, lay out on an oiled cookie sheet with cornmeal to stop sticking.Precook a little in a 300degree oven til set but not brown,Cover with toppings and bake in a 400F oven til toppings are brown.